This Metrolink train car isn't shy about making its point. Photo by Juan Ocampo for Metro. Metrolink and Metro held a media event this morning at Union Station to kick off California Rail Safety Month. The news release from Metro is posted after the jump. 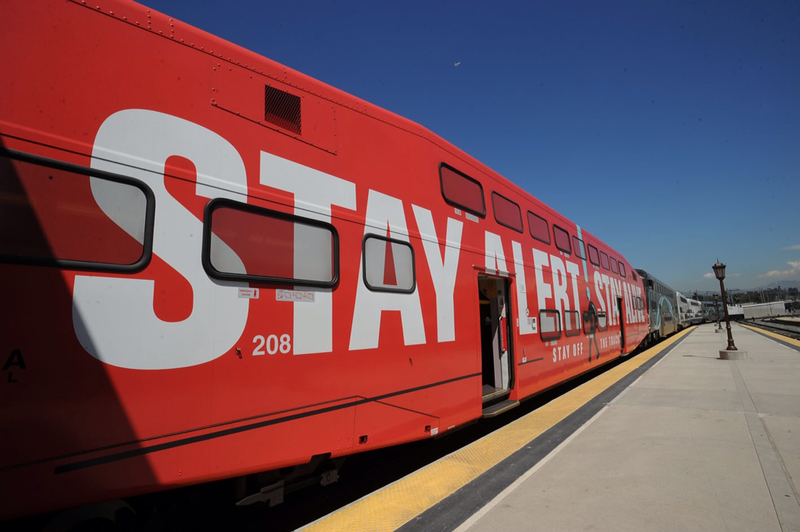 A simple reminder from Operation Lifesaver to kick off California Rail Safety Month: see tracks, think train – because it could save your life. While Metro has installed new safety improvements along the tracks, it's up to you to pay attention and be responsible so you can get to where you're going safely. Check out the following video for examples of what NOT to do around trains. For the stats on accidents and Metro's press release on Rail Safety Month, check out this previous Source post. September is Rail Safety month in California, making it the perfect time to remind everyone to practice safe behavior near Metro trains. In 2009, the California Legislature designated September Rail Safety Month to encourage government, industry and local citizens to improve rail crossing safety and support for rail safety. Although there has been a dramatic reduction in Metro Blue Line accidents this year (3 fatalities versus 8 during the same period last year) — and other rail lines are experiencing low accident rates similar to previous years — Metro continues to develop methods for keeping vehicles and pedestrians aware of and away from moving rail. The Metro Blue Line is a good example of how public education and Metro engineering efforts have resulted in a safer line, both for passengers and for those who travel near and across the tracks. Metro Safety Ambassadors — many of whom are retired rail and bus operators — are assigned to various spots where accidents have occurred in the past. On the Blue Line, 14 Ambassadors are positioned at seven key locations in two shifts, Monday through Friday, when accidents are likely to occur, to answer questions and to warn and educate pedestrians and passengers about the dangers of standing too close to the tracks and trying to beat on-coming trains. They also are there to remind patrons and pedestrians of good safety behaviors, such as looking both directions when crossing the tracks since trains come from both directions. Metro's safety education department has conducted yearly presentations at 160 schools within a 1.5-mile radius of the alignment. It has developed videos and CDs on safe and unsafe behaviors around tracks and trains. Suicide prevention signs have been installed at all stations and at high-speed gated crossings. Additional safety material has been distributed to 250,000 doors near the Blue Line. And earlier this year, Metro began an innovative partnership with the Didi Hirsch Suicide Prevention Center, which works with referrals from Metro to help stop suicides along the Blue Line. Law enforcement also has been heavily involved in the education process. Motorcycle patrols by Transit Services Bureau have been monitoring high-risk areas where accidents have occurred in the past. Law officers have conducted targeted enforcement at high-risk crossings, issuing dozens of tickets to encourage behavior changes. But the public is reminded to stay alert and to practice safe behavior near rail. Rail runs on a line set in stone. It can't change its mind or its path. But people can. This video is sending the wrong message! It shows people “safely” crossing the tracks against the signal, but no trains in sight. Just seems to prove that the signals can be ignored. I agree with Merritt. This video is sending the wrong message. It shows people who safely cross after looking both ways when the bells are ringing. What’s worse, I’ve seen stations that have signals poorly designed so that people are forced to ignore them. For example, the Chatsworth Metrolink station. Train 155 comes in on Track 2, and then holds there for ~30 minutes before turning around and going back into LA Union. However, the entire 30 minutes that it’s sitting there, the bells are clanging away non-stop. “No ped crossing when lights flash” is useless, because there’s no way to get off of Platform 2 without crossing the tracks, and there’s no way to board the train toward Union Station either. You can’t expect people to sit there for 30 minutes while the lights flash constantly can you? Thus, people have gotten used to the bells clanging non-stop and don’t even bother to look before crossing. You’re forced to cross the tracks with bells ringing… and after doing this every day for so long, people start to ignore the bells. During that 30 minute hold that the train is out of service on track 2, there are up to three other trains pass through the station – two Amtraks and a Metrolink. People are so used to crossing the tracks while the bells are clanging that many don’t even bother to look. You get off of 155, come around the front of the train to cross track 2 and can’t see down the line because the giant engine is blocking your view (it parks RIGHT IN FRONT of the crossing), and the bells are always clanging so nobody even hesitates before crossing the tracks. Today could be the day that the southbound Amtrak comes wizzing through because it’s running 5 minutes late. I’ve seen it happen. I’ve yelled for people to stop, and so has the railfan that always hangs out at that station. 155’s conductor usually stands at the crossing to block people from crossing before 115 comes in, but what if he’s in the restroom? It’s an accident waiting to happen. If Metro/Metrolink wants to promote rail safety, they need to look into the issues of WHY people ignore the bells – like when they are warning people of dangers that don’t exist, like a parked train on a different track. The safety devices quickly become ignored when they ring at times there is no danger on the tracks. This is something that should be investigated BEFORE worse problems happen. Whew. That was a long rant. Sorry Metro. The best way to promote rail safety is to build all future stations that completely separate rail tracks and passenger walkways in the first place. Have to agree with Merritt and Collin. Safety measures only work when they are not ignored on a regular basis. Throwing my 2 cents in in the same vein as those above. The delay before a train arrives are way too long. Many times I have seen the Gold Line gates come down well ahead of the time needed. At the South Pasadena Station it used to be insane, now it is only rediculous. I just noted recently at Del Mar how bad it is. At South Pasadena, I have seen the gates go down behind the train before it pulls out of the station. Systems that ‘cry wolf’ are a bad thing. Those that run too long before o after a train are bad. 3 days after the first comments and no feedback from Metro. The duration of these warnings are too long. On the Gold Line this (as well as poor light sequencing) leads to increased congestion at many intersections. BTW, when is Metro going to restore Pasadena Ave & Montery Rd. to the way it was before? Ever heard of “crying wolf,” Metro? All that video shows is that the “safety” guards for the crossings are timed so terribly far in advance that people can very safely ignore them! If you want people to value the warning and safety, you must first make sure that the alarm isn’t laughably overprotective, so that when it flashes, people actually listen.